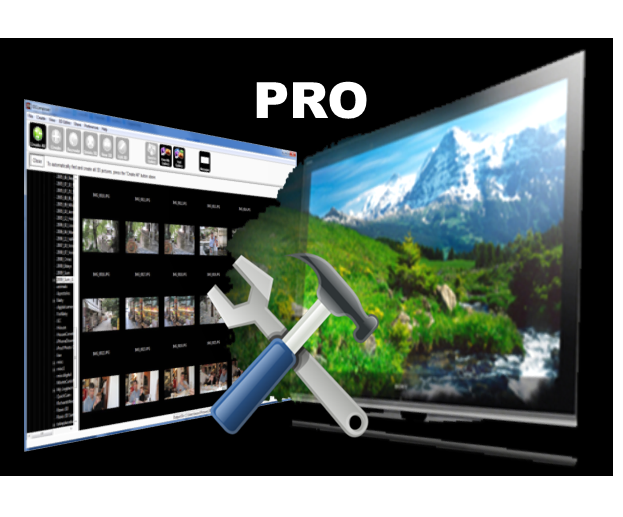 You can see examples of the 3DComposer PRO capabilities in the 3DComposer PRO Gallery or by visiting the 3DComposer PRO album (under Premium and 3DGallery bars) in your 3D Gallery Connect Smart TV app. The following set of figures show examples of the types of problems that can be corrected using 3DComposer. The photos are displayed in an interlaced view with their left and right images superimposed (this is the typical view if you are watching 3D content without 3D glasses on a 3D TV or monitor). 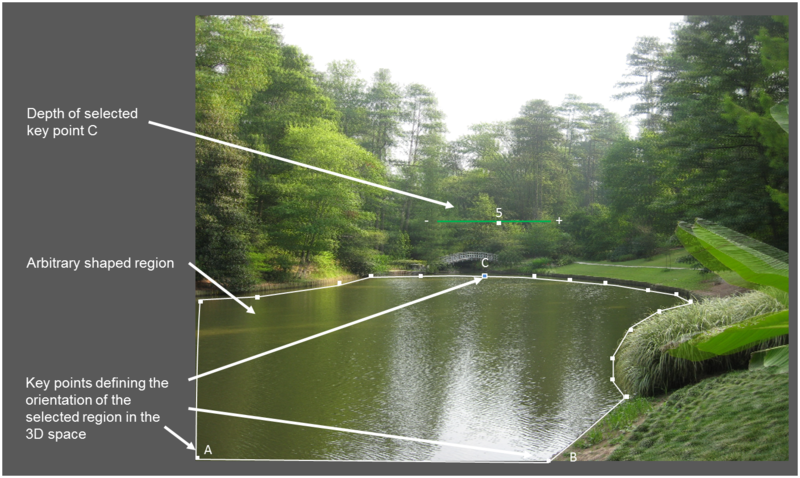 A typical problem of 3D photos created by taking two side-by-side photos using a single-lens camera is water and tree areas. The slightest wind will create uneven wave patterns on the surface of the water between the left and right photos which results in an unpleasant 3D experience. Also wind tends to move leaves and small branches of trees that will cause similar problems. 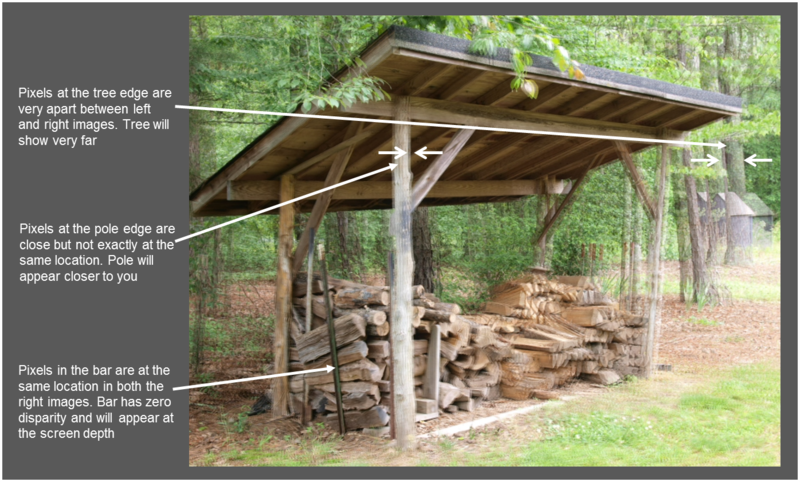 Here is another photo with a different set of problems that can be corrected using 3DComposer PRO. In this photo we have people, cars, clouds, and a flag that are all moving in different directions. 3DComposer PRO is fully integrated with 3DComposer and it can be accessed from 3DComposer viewer. You can double-click any 3D photo to open the 3D viewer. 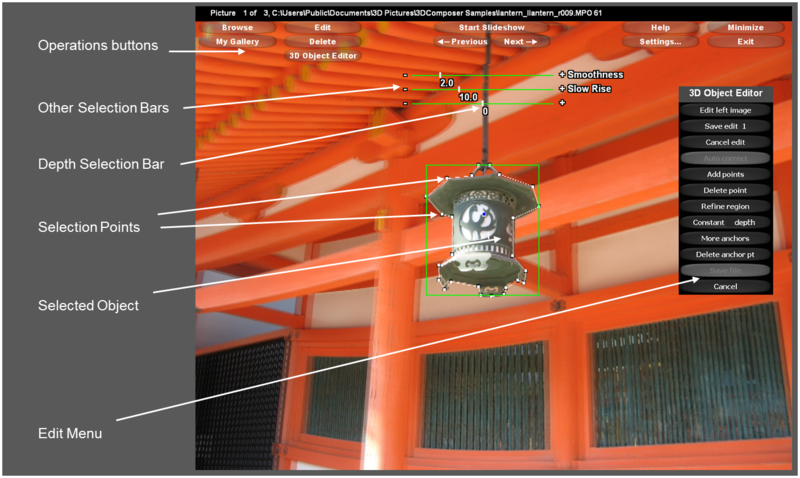 All 3D Object editing functionality can then be accessed through the ‘3D Object Editor’ button of the viewer top menu. It should be also noted that although it is possible to correct any 3D photo with the tools and methodologies supported by 3DComposer PRO, it may not be worthwhile to do so with very complicated images. For example trying to correct a 3D photo of a busy intersection with cars moving in all directions and at different depths, it will take a significant amount of training and effort. However, it is our experience that you can correct most of your photos quickly with great results. IF THERE IS A SIGNIFICANT NUMBER OF VISUAL PROBLEMS IN YOUR 3D PHOTO, IT IS STRONGLY RECOMMENDED TO MINIMIZE EDITING IN 3D VIEWING MODE AND USE INSTEAD ONE OF THE 2D VIEWING MODES TO AVOID EYE FATIGUE AND DISCOMFORT. For example you can perform the object outline process by viewing the left or right image only. More information on how to change viewing modes is given later on. The editor trial runs until 10 3D photos are saved. After that you can continue experimenting with the features of 3DComposer PRO, but you will not be able to save the changes to a file until the proper license is activated. The trial period also expires if no licenses are activated within 60 days of installation. A 3D photo consists of two pictures: the left and right. We will refer to the left photo as the one taken first and the right photo as the one taken by moving the camera to the right in relation to the first photo. The fundamental operation of the 3D object editor is to correct an area of a 3D photo by utilizing image pixels taken from either the left or right photo to replace the corresponding pixels in the right or left photo respectively. An image area can be defined as a rectangle or any arbitrary shape. The boundaries of arbitrary regions are defined by connecting user defined pixels. One term that will be used frequently in this manual is the depth of a 3D photo. 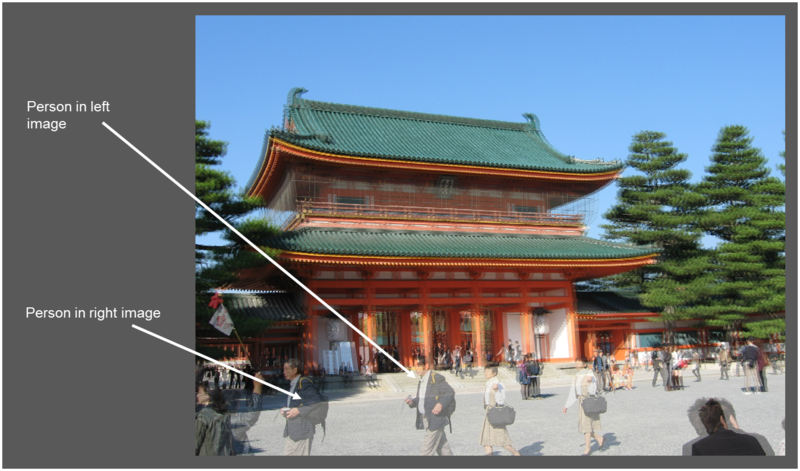 A pixel/object with zero depth is exactly at the same location in both left and right images and it appears as it has been placed on the screen plane of the display. Pixels with non-zero depth are closer or behind the screen plane. The following figure shows examples of various depths in three different parts of the 3D image. · Any area consisting of pixels that have the same depth will appear on the same depth and the area will be perpendicular to the z-axis (i.e., depth axis). · If pixels of an area do not have the same depth, the area will not be at the same depth and it will have a non-zero angle in relation to the z-axis. 1. The Operations buttons that allows you to select the desired function. For description on the standard 3D editing function (i.e., Browse, Edit, Start Slideshow, Previous, Next, My Gallery, and Delete buttons), please refer to the main 3DComposer manual. In this document we describe only the functions performed by the 3D Object Editor button which covers all functionality of 3DComposerPRO. You can use the mouse (left click and wheel control) to create and select objects and the keyboard to perform quick functions. · The mouse wheel is used to control the depth of a point and also to set the value of other editing parameters. Moving the mouse wheel backwards, brings objects closer to you, whereas moving the mouse wheel forward, moves objects away from you,. Since we are editing in 3D mode, any user-interface elements such as lines or menus makes 3D viewing difficult, and for this reason any user-interface items will disappear after few seconds of mouse inactivity. You can make all user interface items appear again by moving your mouse. If you want to keep the user interface items active, then you can leave the mouse pointer in top of the selection menu. During the editing process it is possible that the selection menu sits in top of the selected objects. In this case you can relocate the menu anywhere in the screen by clicking-and-dragging the top bar of the selection menu. 4. Stereoscopic viewing mode. In this mode you can instantly see the results in 3D. During editing, you have the option to edit either the left of the right image of the 3D photo. You can select which image to edit by clicking on either the ‘Edit left image’ or ‘Edit right image’ button (whichever is relevant) at the top of the selection menu. Each edit is a separate operation that needs to be saved or discarded upon its completion. Each edit can be considered as a new edit layer and at the end of each operation you can either chose to save it by pressing the ‘Save edit N’ button, or to cancel it by pressing the ‘Cancel edit’ button. If you are editing layer particular layer and you want back to delete and redo a previous layer, you need to first cancel the edit on current layer, and then press the ‘Undo last edit’ button for each layer till you reach at the target. Currently t is not possible to delete a layer without first deleting all layers in between. Once you have completed all edits and you are happy with the results, you can click the ‘Save file’ button. The save operation will not override the original file, but it will create a new name with the extension editN (where N is a digit that will auto-increment). This is to make sure you do not lose the original image in case of an error. IT IS ALSO HIGHLY RECOMMENDED TO MAKE INTERMEDIATE SAVES OF YOUR RESULTS IN CASE OF A MISTAKE OR A CRASH. ONCE YOU FINISHED THE EDITS YOU CAN GO BACK AND FORTH VIEWING THE VARIOUS SAVED VERSIONS AND DECIDE WHICH ONE YOU WANT TO KEEP. If an object is at the same depth over a fixed background, then it can be easily corrected using a simple rectangle correction at a fixed depth. It should be noted that the background of the object should be almost at the same depth as the object itself. 1. Select ‘New edit rect’ from the menu. A rectangle green box will appear with a bar that indicates the depth of the object. The bar will be initially set to 0 indicating no depth. The rectangle box will have the edit layer ID in its center and three anchor points: by selecting and dragging the center point, you can move the rectangle to the desired location and by selecting and dragging the points at the right and bottom sides, you can resize the rectangle. 2. Place the rectangle shape to the right position and resize it to cover the entire object. 1. Once the rectangle has been placed in the right position, you can adjust its depth to match the surrounding pixels. The adjustment can be done by either using the mouse’s wheel or by selecting and dragging the depth bar. By moving the wheel forwards, you push the object away from you, whereas moving the wheel backwards you bring the object closer to you. On the depth bar, by moving the anchor to the right (+), you bring the object closer to you, whereas moving the anchor to the left (-) you push the object back. 2. Click with the mouse at the point you want to start the arbitrary shape and start defining its outline by clicking at periphery points of the shape. Each new point will be connected to the previous point with a straight line that will define the boundaries of the shape. 3. During the process, you have the ability to refine points. By clicking on ‘Refine point’ button, a zoomed area of the left and the right views around the selected point will show on the screen. To reposition a point, you need to select-and-drag the point in the left window. Once the location of a point has been refined, you can click on the ‘Refine done’ button to return to the line editor. 7. You can delete a point by clicking on the ‘Delete point’ button. In this case, its two neighbors will be connected together forming the new boundary line. Once the shape has been defined, you can adjust its depth to match its surrounding area. The adjustment process is the same as the one described in the rectangle correction section. When finished, you press ‘Save EditN’ and you can move to the next layer. After you have defined a shape, whether it is a rectangle or an arbitrary one, you can click on the ‘Auto correct’ button to place the object automatically at the right place. In this case, the tool will try to match the depth of the object with the depth of the regions around it. It is our recommendation however to use the manual adjustment since it is pretty straightforward and always produces the desired results. 3. Then you click on the ‘Planar depth button. This will assign the letters A, B, C to three points. 3DComposer PRO will try to automatically detect which are the 3 best candidates for the defined shape. 4. You can change the location of the selected points to something that fits the shape you are trying to correct. You can alter the location of the points by clicking to a new point (one of the points that form the boundaries of the shape) and select one of the ‘Depth pointM’ where M is either A, B, or C.
7. While you are performing the adjustment, the depth map is recalculated in real-time thus allowing you to see the effects immediately in 3D space. 9. Once you have completed the definition of the planar depth of the region, you can save the edit and move to the next edit layer. The 3D object editor of 3DComposer PRO allows for even more complicated edits of 3D photos. 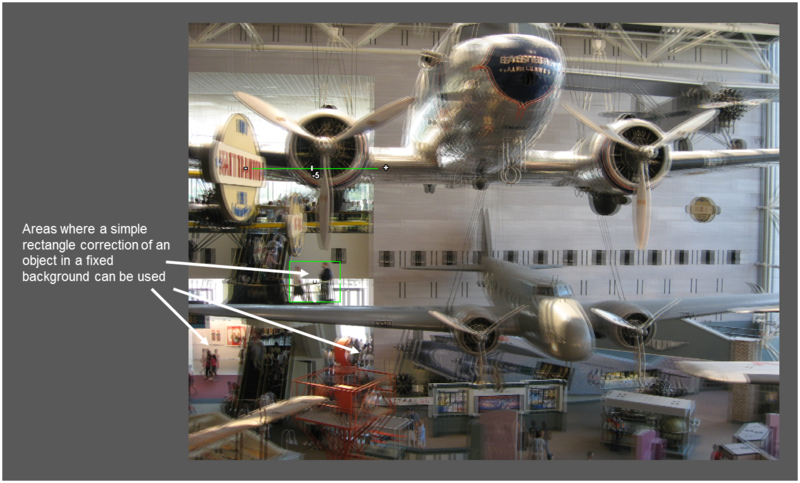 The following figure shows a very complicated 3D photo with a lot of people moving in the scene. In the first case we need to select the person in the left image and then click the button ‘Edit left image’. 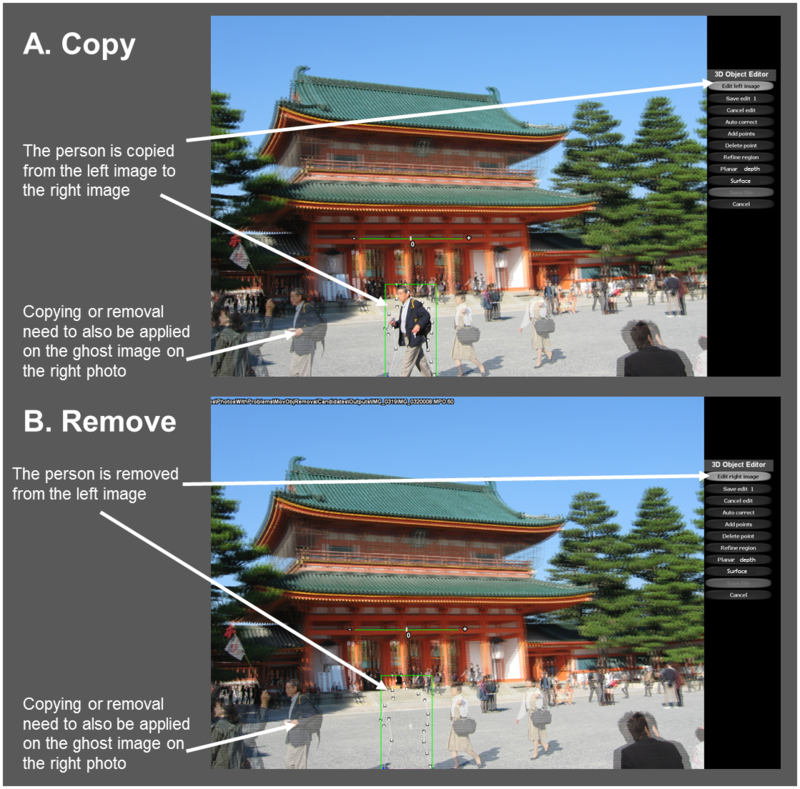 This will effective take the image section from the right image (where there is no person in that location) and will copy it to the left image thus removing the person from the scene (case B in the following figure). The same operation has to be repeated for the right image. In this case we will select the person again, but in this case we will click the button ‘Edit right image’ to copy the data from the left to the right thus removing the person again. At the end of this operation, we will have a clean 3D photo with the person removed. For the second case, you will need to first remove the person from right picture and then to copy the person from the left picture to the right using as reference the data in the left image (case A in next figure). For the third case you will need to do the opposite. It should be noted that this operation may be more complicated if the image areas of the person in left and right images overlap. In this case, there are no data to copy from one image to another and removal or other techniques may be required. The most advanced function of the 3D object editor is the surface editing mode that allows the creation and manipulation of arbitrary shapes in the 3D space. Using this mode, you have the freedom to place any points that define a shape anywhere in the 3D space (in other words you can vary the depth of each point separate from any other). In addition, you can define new anchor points that can be placed anywhere inside the defined shape for which you can control their depth independently of the other periphery or anchor points. The figure below shows a surface example that you can create in the 3D space. You can define a region consisting of Periphery points P1-P4 and Anchor points (A1-A6) and you can control their depth independently to form the 3D surface that is shown in the graph. This surface is then applied to the 3D photo to change the shape of the enclosed object in the 3D space. 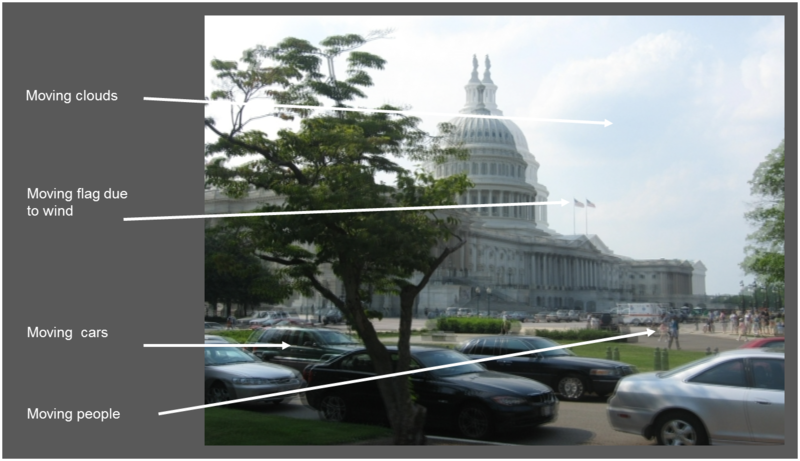 · In windy conditions, when creating a 3D using two side-by-side photos from the same camera, it is impossible to outline all branches and leaves of the tree and perform correction as was described in previous sections. However, with the surface editing function you can outline the area of the tree, you can place it at the proper depth, and then you can define several anchor points and adjust their depth to create a three-dimensional volumetric body of the object. · You can also use this mode to create a 3D photo from a standard 2D photo. Using the surface editor mode, you can outline regions of the photo, place them at the desired depth and change their 3D surface to create a realistic 3D photo. 2. Once you defined the object, you can place it at a constant depth using Constant depth button, or you can use the Planar depth button to change its angle on the 3D space. 3. You can then select the Surface mode to change the depth of the individual periphery points or define new Anchor points. 4. If you enter directly the Surface mode from a surface of constant depth, the New Anchor selection box will show up. You can define Anchor points on the screen by left-clicking at the desired pixel. 6. You can then change the depth of the anchor or periphery points by selecting them (left-mouse click) and moving the mouse wheel backwards or forward to push or bring them forward respectively. 7. You can also change their position in the screen by selecting them (left-mouse click) and dragging them to the desired location. 8. Finally you can control the shape of the surface using the Smoothness and Rise bars. The Smoothness bar controls how smooth the surface is around the anchor points (SHIFT + mouse wheel) and the Rise bar controls how fast the surface will rise from the periphery points (CNTRL + mouse wheel). Once all operations have been completed you can save the particular edit and move to the new one, or save the file and exit. One of the important features of this operation is that you can see all edits in real-time in the 3D space which makes the corrections easy and straightforward. · In case you have connected your PC to a 3D TV, set the display to Projector Only (Windows-P command).